Against all odds, the Trump Administration last week successfully completed one of the most extensive, complex and meaningful declassification initiatives ever, releasing thousands of newly declassified records concerning Argentina’s former military dictatorship and the ensuing human rights violations. 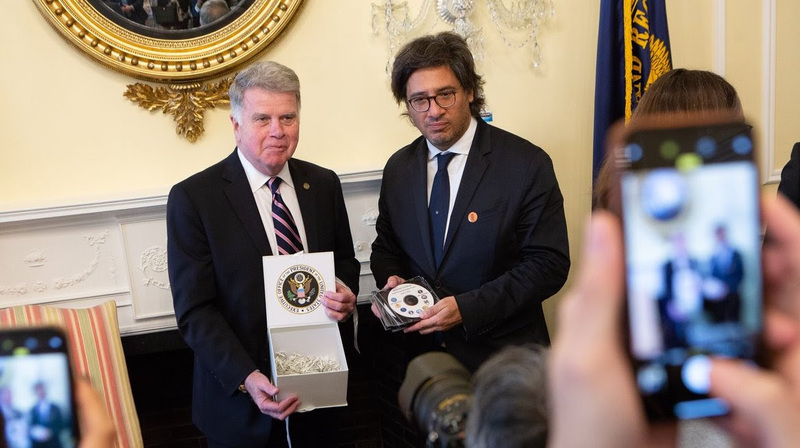 The records were presented to Argentina’s Minister of Justice Germán Garavano by David S. Ferriero, the Archivist of the United States, at a ceremony at the National Archives on Friday. As a result, over 43,000 pages were publicly released on Friday. The release rate was 97%, far higher than is normally the case. While prior releases focused on diplomatic records, last week’s release included an abundance of intelligence agency records. The entire release was posted by the Office of the Director of National Intelligence at intel.gov/argentina. All or some of the records were also posted by the National Archives and the Department of Defense. Whenever tears are shed about declassification, they are likely to be tears of frustration or anger at the inadequacy of the process. But at Friday’s ceremony there were tears of gratitude from Argentine Justice Minister Garavano. The Argentine delegation and others in attendance appeared genuinely moved at the level of effort that was devoted to this project by the U.S. government, which was by all accounts extraordinary. “We have never witnessed the intensity and commitment by the professionals in the National Security Council and the agencies themselves to finding all the documents and declassifying them as fully as possible,” said Carlos Osorio of the National Security Archive at George Washington University. The Archive helped advance the process and published its own descriptive selection of the documents. While the new releases date from decades ago, they nevertheless “hold many lessons for today, and remain highly relevant as the debate over U.S. foreign policy and human rights is revisited,” said Mr. Osorio, who spoke at Friday’s ceremony. Against the backdrop of a declassification system that is severely backlogged and frequently unresponsive even with respect to documents that are decades old, the Argentina Declassification Project stands out as a somewhat mysterious success. Its productivity appeared to result from a combination of uninterrupted White House support, effective NSC leadership, sustained agency cooperation, a compelling diplomatic and human rights rationale for the effort, and popular support from NGOs in Argentina and the US. If the U.S. government can successfully execute a declassification effort of this complexity and sensitivity, then what else might be possible? What is the next frontier in declassification? “I’m thinking about it,” said Archivist Ferriero.